On the bank of the Cooper River at the mouth of Charleston Harbor, and near Tides condos you will find the latest jewel in the crown of historic Mount Pleasant, the town's most recent and grandest contribution to community recreation and civic pride - Memorial Waterfront Park. Conceived as a family-friendly addition to Mount Pleasant's already extensive parks and recreation program and as a tribute to area residents who have died in the service of their country, Memorial Waterfront Park offers a wide array of opportunities both for pleasure and for quiet contemplation. Many years in the planning, the 22-acre park was built at a cost of $14 million and opened to the public on July 4, 2009. One of its most impressive features is its 1,250-foot fishing and pedestrian pier, the longest such facility in the Lowcountry and one of the longest in the Southeast. 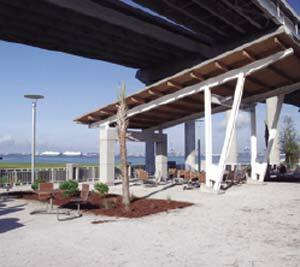 The pier is constructed of tabby concrete - oyster shells mixed with concrete - an important, traditional building material throughout the Charleston area. Partly as a practical matter but also as homage to the past, the pilings that supported what was once the Silas Pearman Bridge were cut down and now form the base of the Memorial Waterfront Park pier. 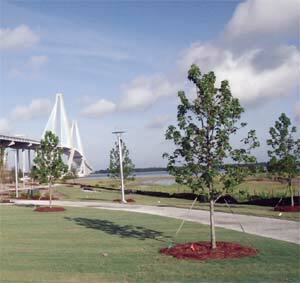 East Cooper residents now travel to Charleston on the Arthur Ravenel Jr. Bridge, a spectacular span opened in 2005 that rises above the park and provides welcome shade from the sometimes scorching South Carolina sun. The dominant feature of the park is its colorful and innovative children's area. Well-lighted and featuring numerous security cameras, the playground boasts a host of unusual and safety-oriented attractions for the kids and comfortable seating areas nearby for their parents. The perimeter of the playground is discreetly fenced, with access only to the rest of the park, not to nearby roads or parking areas. As a tribute to Mount Pleasant's heritage as a home port for working shrimpers, the playground features a kids' shrimp boat, part of a complex of bridge-like structures that mimic the Ravenel Bridge overhead. These bridge-like structures are complete with slides, stairs and netting attached to the shrimp boat so kids can climb easily from one to another. Beneath it all is a light blue rubber pad, for safety and to represent the blue waters that surround Mount Pleasant. At the park, a tidy shop sells snacks, gifts and tackle and rents fishing gear for use on the pier, and there are plenty of restrooms and picnic areas, as well as a visitors' center. A sweetgrass pavilion educates visitors about the Gullah tradition of sweetgrass basket making and to honor the artisans who continue that tradition today along a designated section of U.S. Route 17. As the park's name suggests, its outstanding feature is the memorial itself. Dedicated to the serviceman and women from Mount Pleasant and its precursor, Christ Church Parish, who lost their lives fighting for the cause of freedom, it was created at a cost of nearly $1 million. The memorial includes a reflective pool, brick-lined paths and a sculpture by celebrated artist Raymond Kaskey, whose other architectural sculptures include the National World War II Memorial on the Mall in Washington, D.C. Kaskey's Mount Pleasant work is a bronze female figure representing contradictory emotions of loss and hope. In her left hand, she holds a tri-folded flag - similar to the one presented to grieving widows and mothers. Her right hand rests upon a World War II helmet, supported by a rifle. For family fun, fishing, an evening of entertainment or the opportunity simply to relax and reflect, Memorial Waterfront Park is a special attraction in a town that thrives on offering its residents and visitors nothing but the best.